The wait is almost over as the women elite athletes go through their individual pre-race routines ahead of the 2018 ITU World Series Grand Final in Gold Coast, and Australia’s most famous triathlon venue is buzzing. And the anticipation of Saturday afternoon’s race is high not just because of the occasion. This year’s World Championship title will almost certainly boil down to a straight battle between two great rivals: whoever finishes ahead between USA’s Katie Zaferes and Great Britain’s Vicky Holland, will win the crown for the first time. Gold Coast represents a classic challenge for the 58 athletes taking to the line on the edge of Mitchell Park, a two-lap swim followed by a flat but intense eight-lap bike and finishing off with four loops and 10km around the park that look set to produce one of the most exciting season finales in what has been an incredible decade of the competition. Wearing the number one, USA’s Zaferes has been a consistent performer all year after recovering from a crash in the Abu Dhabi season opener. Taking to the podium no fewer than six times, she has yet to taste victory in 2018, and knows that Gold Coast would undoubtedly be the time and place to do so and guarantee her that precious title. Vicky Holland is one person that Zaferes would not want to be facing in this situation, however. A titanic battle in WTS Leeds saw Holland hold off a brave challenge from the American to win gold, a feat she has repeated in her last two races in WTS Edmonton and WTS Montreal, results that have catapulted her into contention and looking back in her very best form. Of the two athletes, only Zaferes has previously won a medal to date on this course, however, earning the bronze back in 2015. A strong British contingent sees Georgia Taylor-Brown and Jessica Learmonth as the only two athletes with a mathematical chance of wrestling the World Championship title from their hands, while Americans Taylor Spivey and Kirsten Kasper will want to deliver more than a supporting role and to close out their WTS seasons on a high. 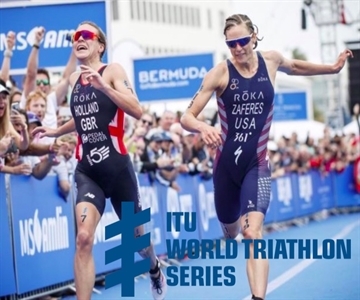 Rachel Klamer’s year could hardly have started any better as she won her first WTS race in Abu Dhabi, but fourth in Leeds has been her best finish since leaving her out of the race for the world title. The Australian fans will be hoping for a big display from Ashleigh Gentle and Natalie Van Coevorden. Gentle finished second in Edmonton at the end of July and has played a key role in the success of the Australian Mixed Relay team this year along with Van Coevorden, who delivered a brilliant third in Abu Dhabi but has failed to find the podium since. New Zealand’s triathlon hero Andrea Hewitt has looked strong once more and won here over the sprint distance course, while Japan have Yuko Takahashi and Yuka Sato as their main medal prospects in the 2018 Grand Final.